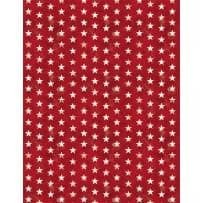 AMERICAN VALOR 84433-313 Stars Red from Wilmington Prints by Stephanie Marrott. Valor is often displayed in the face of something designed to crush it, like a battle in a war. American Valor by Stephanie Marrott honors those who have given much in support of freedom. It is a perfect choice for projects and quilts to show your pride in the land of the free and home of the brave. Quilting fabric, 100% cotton material, 44/45" wide.